Proposition 127 is a constitutional amendment requiring utilities in the state of Arizona to provide at least 50 percent of their electricity from renewable energy sources by 2030, with annual interim milestones beginning in 2020. These milestones include a percentage of renewable energy from distributed sources (such as rooftop solar panels, where the electricity is generated from small-scale and on-site locations), to reach at least 10 percent by 2030. Proposition 127 was developed by Clean Energy for a Healthy Arizona. The Arizona Corporation Commission (ACC) regulates certain utilities, including Arizona Public Service (APS) and Tucson Electric Power (TEP). ACC commissioners are elected and the ACC’s authority is derived from the Arizona Constitution. The ACC is not subject to statutes passed by the state legislature or direction from the governor’s office. Consequently, the only way to ensure the ACC takes a particular action is by amending the constitution. The Arizona Constitution has already been amended over 150 times. Will Proposition 127 raise my electricity costs? The Central Arizona Project (CAP) recently signed a power deal to build a 30-megawatt solar plant for just 2.5 cents/kWh. Tucson Electric Power (TEP) signed a power purchase agreement with NextEra Energy to build a solar-plus-storage project for just 4.5 cents/kWh, with the solar component priced under 3 cents/kWh. Compare this deal to the 2017 energy analysis by Lazard (a leading independent financial advisory firm) of the cost of electricity generated by a gas peaking facility ranging from 15.6 to 21 cents/kWh and the cost from a gas combined cycle plant ranging from 4.2 to 7.8 cents/kWh. In Colorado, Xcel Energy recently submitted a plan to the Colorado Public Utility Commission (PUC) to increase its renewable energy portfolio to 55 percent by 2026. The PUC unanimously approved the request, which is projected to save customers more than $200 million. 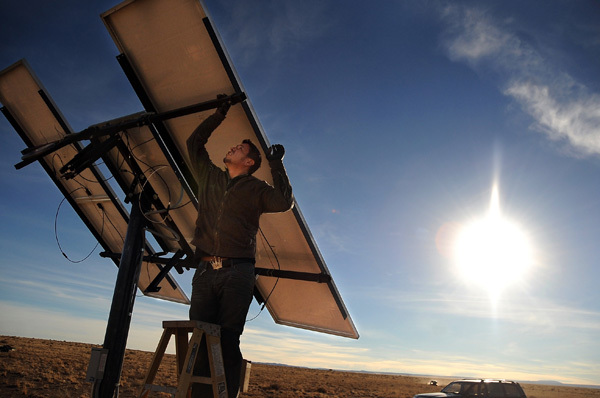 A Union of Concerned Scientists analysis shows that if New Mexico strengthens its renewable energy portfolio to 50 percent by 2030, most households will see a decrease in electricity costs. Will Arizonans lose jobs over this? Where does hydropower fit into this? Proposition 127 allows utilities to count only the electricity generated from hydropower facilities built before 1997 that comes from an increase in power due to improved technological or operational efficiencies. Proposition 127 allows utilities to include power generated by new small-scale (less than 10 megawatts) hydropower as long as it does not involve any new damming, diversion, or changes in water flow that have adverse effects. Where does nuclear power fit into this? Electricity generated by nuclear facilities cannot be used to satisfy the renewable energy goals required by Proposition 127. Why does the Grand Canyon Trust support Proposition 127? Proposition 127 will accelerate renewable energy, reduce our reliance on fossil fuels, and greatly reduce the amount of water used to generate electricity. It will also improve air quality, help mitigate climate change, open the door for tribes to benefit from developing and owning renewable energy plants, create jobs, and improve our energy independence. Will Proposition 127 help those living off the electrical grid? Proposition 127 will not bring off-grid electricity to those who live in remote or rural locations and are not customers of a utility regulated by the Arizona Corporation Commission. However, it may stimulate the development of utility-scale renewable energy projects on tribal lands or in other rural areas that could be owned and operated by local communities or landowners, with the electricity sold to the utilities, generating income and jobs. Will passing Proposition 127 force Palo Verde nuclear plant to close? No. The Natural Resources Defense Council has published two reports, one in June 2018 , and one in September 2018, showing that Palo Verde will not close. Adding low-cost solar to the regional power mix displaces higher-cost coal and natural gas, rather than the electricity generated by Palo Verde, which is relatively cheap to operate, and significantly cheaper than most other nuclear plants. Additionally, APS does not have the legal authority to close Palo Verde, as APS is just one among seven owners. Palo Verde is the lowest-cost electricity producer currently in the APS portfolio and it is immune to the volatility of natural gas prices. Furthermore, decommissioning the plant will cost an estimated $2.7 billion. All of the utilities that own Palo Verde are paying into a fund for decommissioning costs (since shutdown of the plant is projected for 2045-2047). Shutting it down prematurely would mean that the utilities would need to come up with an enormous amount of money much earlier than anticipated. Number of jobs Arizona is expected to gain if Proposition 127 passes.